New breakthrough golf improvement system on CD helps you hit your ball longer, straighter, putt like a pro, hit tee shots long and straight down the middle of the fairway, lower your handicap 5-10-15 strokes, and much more! Does this describe you? You spend a fortune buying and trying golf clubs to improve your game. You spend money on expensive golf lessons. You spend hours on the driving range and putting green. You subscribe to all the golf magazines to get tips on how to improve your game. You buy golf books, videos, CD's, and DVD's. You buy all the devices, gadgets, and accessories you see in the golf stores, golf magazines, info-commercials, and ebay to improve your game. Also, you buy the expensive golf balls that the pros use. And after doing all this, your game is still inconsistent. You never know what to expect from one game to the next or from one hole to the next. You just can't seem to get over the hump and you are so frustrated. You can't see to figure out what in the hell is wrong. Well there is a rather simple explanation for this. You see...it takes a bit of confidence to play good golf. Confidence in yourself. Confidence in your golf skills. Take any golfer who is on top of his game...and you'll find that they have all the confidence and self-assurance in the world. This type of golfer has a "positive self-image" on the golf course. Some golfers just naturally possess the quality of self-confidence. And they put it to use whenever they're on the course. They let it work for them every time they hit the ball. They have learned to rely on it. And it seldom lets them down. On the other hand: Some golfers like yourself are not naturally in possession of this priceless asset of self-confidence (positive self-image)...and therefore must find a way to change their negative self-image and lack of confidence in their golf skills to one of a positive nature. Now...At Last! With our surefire breakthrough golf improvement system in our new eBook on CD called, "The Easy Way to Improve Your Golf; With S/A Golf Hypnotism," you will be able to develop more than enough confidence to improve your game. Once you acquire this new inner-confidence, you will find it extremely easy to make shots you never thought you could, hit the ball long, high, and straight down the middle of the fairway, cut 5-10-15 strokes off your handicap, and take your game to the next level. THAT'S WHAT S/A GOLF HYPNOTISM CAN DO FOR YOU! Keep in mind as you keep reading - we are not talking mere theory or giving you our opinions. We are giving you COLD HARD FACTS! You will be able to hit all your shots higher, straighter, and longer and the ball lands exactly where you want it to. It will be easy for you to hit the green from 150 yards or less. You will have absolutely no fear of any bunker and you will easily get up & down from any bunker and you can play any sand shot from any lie. Whenever you hit a shot, you will be totally free from all negative feelings...such as worry, nervousness, or lack of confidence. You always hit the ball with the clubface square to the target. You will be able to pick out where you want the ball to land on the fairway and nail it almost every time! You will be in total control of your emotions on the golf course. You won't lose your temper when you make a bad shot. You're able to stay calm and focused and picture your next shot as one of the best shots you've ever hit. You will be able to improve your iron shots by striking the ball with a slightly descending blow with the club brushing or nipping the turf after contacting the ball. Your left elbow will stay tucked in during your follow-through to achieve pinpoint accuracy. When you hit your driver, you will keep your left arm as straight as possible on the backswing to ensure a wide swing arc. You will be able to add 20-40 yards to your tee shots. You will be able to ice business deals with clients while playing golf. These are just some of the benefits available to the golfer who has a "positive self-image" and supreme confidence in his or her game. And these are the benefits that will be available to YOU...once you develop your own positive self-image and confidence through S/A Golf Hypnotism. S/A Golf Hypnotism - What Is It? S/A Golf Hypnotism is self-administered hypnotism to reprogram your subconscious mind. It is also known as autosuggestion or simply called self-hypnotism. But they all add up to basically the same thing: Hypnotism performed BY yourself...ON yourself...for the purpose of replacing certain negative qualities in your golf game with those of a positive, more desirable nature. "We are what we "think" we are." Read that sentence again. Think about it. It's quite true. We truly ARE what we THINK we are. If you don't "think" you can make that ten foot putt, you probably won't. If you don't "think" you can hit the fairway, you probably won't make it. If you don't "think" you can make that golf shot, YOU PROBABLY WON'T! But it's a little more than merely thinking about it. You must honestly BELIEVE. Believe in yourself. Believe that you will at least par every hole you play. Believe that you will hit the ball long and straight down the fairway. Believe that you always hit the green from 150 yards out. . . etc. And before you can expect to be a low handicap golfer, you must honestly "believe" you have that certain "something" that makes you a great golfer. You must believe it with all your heart. Then...and only then...will you become the successful golfer you have always wanted to be. Once your subconscious mind (After using our S/A Golf Hypnotism system) believes you are a great golfer who consistently pars or better on every hole, a golfer who consistently makes his shots, hits the fairway, hits the greens and takes only two putts or less to get the ball in the hole, your conscious mind will begin to believe it. And once this begins to happen, you will automatically come into possession of that all-important "self confidence." Which in turn, leads you directly to the success on the course that you've always wanted. Making Your Subconscious Mind "Believe"
When using S/A Golf Hypnotism, you will be able to give your subconscious mind "suggestions" (We provide you with 25 surefire suggestions that are guaranteed to improve your game). After a short time your subconscious mind will begin to believe the information that you have been feeding it and will finally accept it as "truth." At that time when your subconscious takes the suggestions you've been giving it as "truth," a positive change will immediately take place in your conscious mind and, thus, in your every-day way of thinking and playing golf. Does S/A Golf Hypnotism work? These principles have helped countless men and women achieve success in their own particular calling. And...these very principles will help you become a better golfer. Before long, your golf buddies will stare in amazement at all the great shots you make. Remember - we guarantee it will work for you IF you give it an honest try. You will automatically become the great golfer that you are commanding your subconscious mind to help you become. For example - when you say to yourself, "I am now curing my slice," (while in a state of Golf S/A Hypnosis) you will actually form a picture in your minds eye of you hitting the ball long, high, and straight toward the target. You SEE yourself hitting the ball with an in-to-out swing path and the clubface is always square to the target at impact. Do this...and the next time you are in a real life situation on the golf course you won't hit slices anymore. Just have faith in these principles and have faith in yourself. Believe that these principles will work for you, and they won't let you down. Do your part (practice S/A Golf Hypnotism faithfully), and nature will do the rest. You will be able to cure your slice by no longer hitting the ball with an out-to-in swing path and your clubface will not be open at impact. Your failure days with your chip and pitch shots are gone forever and your chip and pitch shots will now be dead on the pin. You will be able to hit the majority of all your tee shots long and straight down the middle of the fairway. You won't panic when you have to make a shot to clear the water. You just forget about the water and pretend it's just grass there and confidently hit the ball with your normal rhythm and swing. You will improve your game by not trying to steer your club into the ball, instead you concentrate on swinging the club head toward the target. You will devote most of your time to improving the all important short game instead of being obsessed with trying to see how far you can hit your driver. You will always have your club head in the perfect position upon impact with the ball. Your alignment is always perfect because you always line up the clubface square to the target and your feet, hips and shoulders are lined up parallel to the clubface. You will always focus on the target and create a vivid picture of where you want the ball to go during your pre-shot routine. You will always approach every bunker shot with the deep gut feeling that you're going to knock the ball into the hole. Bunker shots don't scare you and never will! When you are at the driving range you will be able to trick your mind into thinking you are in a game situation. You pretend you're on the course and try to hit the perfect shot. This in turn improves your game tremendously when you get on the course. Why do some men or women succeed at golf while others fail time and time again? You should know the answer by now. What's the major difference between the man or woman who is at the top of their game and the golfer who that's not? What's the difference? The way he or she thinks! That's the difference. The man or woman who is on the top of their game thinks in terms of 100% success on the course at all times. While the golfer who is not at the top of their game thinks in terms of failure most of the time. Jim Flick, one of the greatest golf instructors of all time once said, "Golf is 90% mental and the other 10% is mental. In other words, if you learn to control your mind there's no limit to how good of a golfer you can become. And this is exactly what S/A Golf Hypnotism can do for your golf game by controlling your mind. As a matter of fact, the mental part of golf is so important that all PGA pros have a coach to work with them on their mental game which is the key to playing with confidence, hitting good shots consistently, and shooting lower scores. Also, just about every pro or PGA player agree that golf is 95-99% mental. Perhaps, in your case, you've been having a hard time improving your game because you subconsciously EXPECT to have a hard time! When you try to make a good shot, you fail. Why? Because you subconsciously EXPECT to fail. As an example: When you try to avoid a water hazard, you hit the ball in the water a lot of the time. Why? Because you subconsciously EXPECT to hit the ball in the water. And it's the same story when trying to avoid bunkers, trees, hitting the ball out of bounds, etc. But, when you practice S/A Golf Hypnotism, your failure days will be gone forever because your subconscious mind will be reprogrammed to expect success on all of your shots. Once you begin to change your way of thinking - subconsciously - through S/A Golf Hypnotism - your success on the course will automatically rise...rise...and your handicap will go down...down until you become the golfer you've always wanted to be. If you will do just that much, we guarantee that your golf game...will take on such a complete change that you will think you were a reborn golfer by some kind of miracle. But we assure you, it will be no miracle. It will be the mighty force of nature's law working for you. It's all up to you. Good luck. It's been our pleasure talking with you - and remember: "Future success with golf lies within YOUR OWN MIND!" If you answered Yes to any of these questions, then you must try "The Easy Way to Improve Your Golf; With S/A Golf Hypnotism" eBook on CD completely at our risk. Your eBook will be in the format of a PDF file that will be sent through the U.S. Mail on a CD. For those of you that don't know what an eBook (electronic book) is, this is a book in the form of a PDF file that contains the exact content as the printed or hard copy book. Just simply put this CD in your CD-Rom drive and double-click the file to read or print your eBook. If, for any reason, you are not satisfied with "The Easy Way to Improve Your Golf; With S/A Golf Hypnotism" or do not see a marked improvement in your game, just send the CD back and request a refund and you will receive a no-questions asked refund. This is how positive we are that "The Easy Way to Improve Your Golf; With S/A Golf Hypnotism" will cut strokes off your game. P.S. 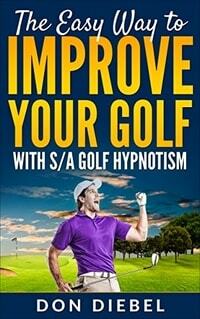 Order "The Easy Way to Improve Your Golf; With S/A Golf Hypnotism" today! As soon as you do, you'll be on your way to the lowest golf scores you've ever shot. P.S. Take advantage of our Charge-by-Phone service. Call 830-496-3337 anytime, 24 hours a day, to use your Visa, MasterCard, American Express ,Discover Card, JCB, or Diners Card. (If you get our voice mail system, please leave a message with the name and item number of the product, your name, address, phone number, credit card number and expiration date. Please speak clearly and slowly).